Facing the Beagle Channel a few miles from Ushuaia, the 5-star Los Cauquenes Resort & Spa invites you to enjoy moments of relaxation in a friendly environment with professional service. In addition to comfortable beds and spacious bathrooms, the rooms offer beautiful views of the water and the mountains. You can also enjoy spectacular views while savoring a sumptuous breakfast or taking time out in the swimming pool. A spa with sauna, Jacuzzi, gym and a high-standard restaurant are available on site, too. A free minibus runs during the day from the Los Cauquenes to Ushuaia, which is about 15 minutes away. 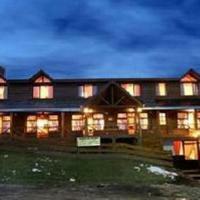 The hotel is 2.5 miles from the Malvinas Argentinas Airport and 9 miles from Cerro Castor. This hotel was built in 2005 in front of the Martial mountainous chain, following the typical standards of the houses from Tierra del Fuego. The hotel has a breakfast room and a living room with a bar. All rooms have excellent views of the Martial mountainous chain, Mount Olivia and Pipo River. They are decorated with a warm and rustic style and include bathtub and heating, among other facilities. The hotel serves a breakfast with coffee, milk, tee, juices, cereals, fruits, bread, cheese, ham, butter, jam, yogurt etc. During the day or in the evening, guests can relax at the bar while reading or enjoy their favorite drink. This hotel is in a privileged area 5 miles from the center of the city and features external, carpeted rooms with a view of the Canal de Beagle or over the Cordillera De Los Andes. The place features also big communal spaces in 2 floors, including a bar and breakfast area, reading room, satellite TV and DVD. The staff is qualified and willing to offer personalized information about tours, reservations, car rentals and transportation, making your stay more comfortable and pleasant. Costa Ushuaia is located 2 miles from downtown Ushuaia, and offers panoramic views of the Beagle Channel. The airport is nearby. There is free parking and Wi-Fi access. Rooms at Costa Ushuaia are comfortable and modern. There are a range of room types, each with cable TV. Breakfast is included. The hotel has a game room and children's play area. Free parking is available. Los Ñires showcases the amazing landscape of Tierra del Fuego. Its spacious, beautifully decorated rooms have large windows overlooking the Andes range or the waters of the Beagle Channel. Hotel Los Ñires is located 4 kilometres from the international airport and 6 kilometres from the centre of Ushuaia, commonly known as the southernmost city in the world. A few meters from the Beagle Channel and the main museums of Ushuaia in Terra del Fuego, this 4-star hotel offers suites and apartments with a magnificent view. The apartments Cilene del Faro Suites & Spa look out either on the Andes mountain range or on the Beagle Channel. The spa is for the exclusive use of hotel guests, and includes a heated pool, relaxation room, sauna and Scottish shower. Enjoy a drink in the panoramic glass bar at the top of the hotel, while admiring the view of the Beagle Channel. Take advantage of the valet parking available at the Cilene del Faro. Guests participating in winter sports can safely store their skiing equipment on site. Situated a few steps from the Beagle Channel and on Ushuaia's Main Avenue, this boutique hotel offers elegant accommodation with free internet access, balcony and complimentary breakfast buffet. Recently renovated, rooms at Lennox Ushuaia feature warm decor and design, featuring a minibar, safe, and a private hot tub. Widely considered to be the world's Southernmost city, Ushuaia is an ideal base for exploring the island of Tierra del Fuego and the beautiful region of Patagonia. Situated 2.5 miles from Ushuaia and 1.8 miles from the international airport, this 3-star hotel is situated on a hill overlooking the Andes mountain range and the Beagle Channel. Tierra de Leyendas offers cozy, rustic-style rooms with a private bathroom, TV and telephone. All rooms have large windows to allow an even better view of the magnificent surroundings. Wake up to a delicious homemade breakfast buffet. In the evenings enjoy smoked Patagonian specialties with a bottle of wine. Free Wi-Fi internet access is available throughout the Tierra de Leyendas. 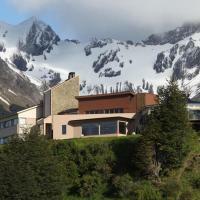 The 3-star Kauyeken is a mountain-style hotel set in a beautiful natural landscape, 3.5 miles from Ushuaia town center and about 9 miles from the Castor Mountain. During your stay, you can visit the hotel's spa to enjoy a whirlpool, sauna, and gym. The Kauyeken's restaurant is another highlight. After a hearty breakfast buffet, you are invited to savor the best of Patagonian cuisine and Argentinean wines and admiring the beautiful views of Olivia River. The hotel also has a relaxation room, a TV room, as well as a reading room. Conveniently located withing walking distance from the city centre and commercial area, Hostal del Bosque offers spacious and charming apartments with panoramic views in Ushuaia. Free Wi-Fi is available throughout the hotel. Every apartment in Del Bosque features a microwave, an electric kettle, TV, free Wi-Fi, telephone and minibar. Room service is provided. Guests at Apart Hotel del Bosque can order regional dishes and a select list of Argentinean wines at the hotel's restaurant. The city's commercial area is 400 metres from the property. This small hotel offers a cozy environment and accommodating staff in a peaceful area with beautiful surroundings which is 15 minutes by car from downtown Ushuaia. Each of the accommodations provided at Hosteria del Recodo is carpeted and equipped with free internet connection. The windows face the Beagle canal, the mountains or the city. A Continental breakfast and a snack bar are available inside the Hosteria del Recodo. Within a few feet of the property, you will find a grocery store, where you can also take a bus to downtown. The 4-star Hotel Albatros provides spacious accommodations and a complete spa in the heart of Ushuaia, next to the city’s harbor and main street. The spa offers a Jacuzzi, sauna, relaxation area, gym, massages and body treatments. Parking and Wi-Fi are available for free. In addition, three computers with free internet access are provided in the lobby. Next to it, the restaurant invites you to enjoy a daily breakfast for free. The varied menu offers international and regional dishes as well as a select list of Argentinean wines. In the center of Ushuaia, this hotel offers modern accommodations with views over Encerrada Bay. It is a 5-minute drive from Malvinas Argentina International Airport and offers free parking. Rooms are spacious and offer free Wi-Fi and LCD TVs. Guests can enjoy a number of local dishes from the hotel’s restaurant, or enjoy panoramic views from the bar. The front desk is available 24-hours a day to help guests arrange activities and services. The América Hostería y Restaurante is located in the heart of Ushuaia nearby Parque Centernario. This family run hotel and restaurant offers comfortable rooms and free Wi-Fi in public areas. All of the rooms at América Hostería y Restaurante have views over Beagle Channel, full private bathrooms and TVs. América Hostería y Restaurante’s restaurant serves a buffet breakfast for guests. The restaurant serves international cuisine, and its well known specialty is spider crab. The Ushuaia International Airport is just a 10 minute drive from the hotel, which provides free private parking for guests. Located in central Ushuaia, Los Naranjos offers comfortable rooms with panoramic views of the surrounding Andean mountain range, or the Beagle Channel. Free private parking is available. All rooms of Los Naranjos are equipped with free Wi-Fi, cable TV and a safe. Guests can benefit from the 24-hour front desk service Los Naranjos provides. The restaurant serves traditional Andean dishes, as well as international dishes. Los Naranjos is located on the main street of Ushuaia, called San Martin. Many shops, restaurants and bars are therefore just a few steps away. Valle Frío Ushuaia is a family-owned inn situated in the Tierra del Fuego Province. It offers panoramic views of the mountains and is a perfect base for exploring Argentinean Patagonia. The modern rooms at Valle Frío have colorful decor. Each comes with a private bathroom, cable TV and individually controlled heating. Guests can relax in the hotel bar with a drink, or enjoy a book from the in-house library. The staff on the hotel tour desk can offer advice regarding the town’s main attractions, including the End of the World and Maritime Museums. Beagle's Channel can be reached in under a 10 minute walk. This cozy, privately-owned lodge is located in the heart of Ushuaia, Tierra Del Fuego. It offers a 24-hour front desk and views of the Lenga Forest. The Rosa De Los Vientos has charming rooms with cable TV, a minibar and a private bathroom with amenities. In the mornings, the Rosa serves a delicious breakfast made with regional ingredients. The Rosa has a 24-hour front desk and a tour desk. Free Wi-Fi and free private parking are available. Located one mile from the center of Ushuaia, Patagonia Villa offers free Wi-Fi and modern accommodations in scenic surroundings. Some villas include private balcony or jacuzzi. Accommodations offer panoramic forest and mountain views, in close contact with nature. The villas were constructed with beech logs and natural stone from the area. All of Patagonia’s villas include a kitchenette and a dining area. Other amenities provided are a minibar and a fireplace. The bar at the Patagonia Villa offers drinks and refreshments. The hotel also provides a car rental service. Martial Glacier is 5 miles away, while the End of the World Train is a 10-minute drive from the hotel. 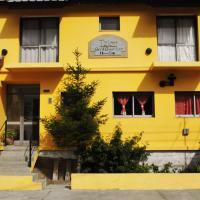 This bed and breakfast offers heated rooms, some having panoramic views of the Beagle Channel and the city. It features a shared living area with library and TV as well as free Wi-Fi. All rooms at the Hostería Ailén have a private bathroom equipped with a hairdryer. A safe is also available in the room. Breakfast is served each morning in the cafe with large characteristic windows. Guests can enjoy their own meals here during the rest of the day. A microwave is available. Ailén can assist in planning your stay in Ushuaia and in booking sightseeing trips to nearby places of interest. Ski equipment and ski passes are available at the hotel. The hotel is 2.5 miles from downtown. Malvinas Argentinas Airport Ushuaia is only 2.5 miles away. Hostería Ailén provides free on-site private parking. The Hosteria Chalp is situated in Ushuaia, less than 2 miles from the bay. It has free on-site private parking, and offers accommodations with views of the Martial Mountains. All Hosteria rooms have wood furnishings and are decorated in warm colors. They come equipped with TV and free Wi-Fi. They also have private bathrooms. In the morning the Hosteria Chalp serves a buffet breakfast. Guests can relax on the rooftop terrace and make use of the barbecue facilities. There is also a game room with billiards. The Chalp is located on Avenida Alem, and provides 24-hour front desk service. The Canal de Beagle is less than a 15 minute drive away. Hotel Alto Andino offers non-smoking rooms with free Wi-Fi access and a terrace with panoramic city and bay views. The bay is less than one km away. All rooms have modern furniture and fittings which include a flat-screen TV with cable channels and a minibar. Each en suite bathroom has bathroom amenities. Tropical cocktails and light meals are served at the snack bar. Citywide tours and outdoor excursions can be organized by the hotel’s staff. Other services include a 24-hour front desk and luggage storage. Alto Andino Hotel is 800 metres away from the Maritime Museum. Hosteria Foike is a stylish hotel overlooking Beagle Channel and Ushuaian Mountains. It has a library and an art gallery, and provides an excellent base for exploring Tierra del Fuego. Ushuaia is the southernmost city in the World. Guests can visit the Martial Glacier, take a boat trip to Bird Island or explore the area on a dog-sled or snowmobile. All of the heated guest bedrooms at Foike Hosteria feature free Wi-Fi and an LCD TV. In addition, every room has a private bathroom, a safe and a hairdryer. An extensive breakfast buffet is served each morning in the cozy dining area. The restaurant serves regional specialties complimented by a select wine list. Guests can ski at Cerro Castor 16 miles away, or take a day trip on the End of the World Railroad. Hosteria Foike is 6 miles from Ushuaia Airport. Free parking is available nearby. 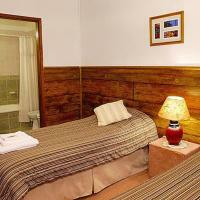 The Monaco is a large guesthouse central Ushuaia, on the commercial San Martin Street. It offers pleasant rooms with free Wi-Fi and a tour desk for booking regional excursions. Rooms at the Hotel Monaco offer simple yet comfortable furnishings with plenty of wardrobe space. All have cable TV, heating and private bathrooms. Some rooms offer views of Beagle Canal, only 2 blocks away. Guests at the Hotel Monaco can benefit from its proximity to the Cerro Castor Ski Station. They can also inquire at the tour desk regarding hikes through the Cordillera de los Andes Mountain range. A continental breakfast buffet with fruit, cereals and bread rolls is served, and guests can use the on-site restaurant. Due to its central location the Monaco is within walking distance of several restaurants and bars. The Monaco is conveniently located only 10 minutes by car from Ushuaia Airport. 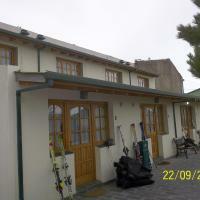 In Ushuaia´s residential area, 3 km from downtown, this guesthouse offers apartments for up to 5 people. They are fully equipped, featuring balcony, cable TV and free Wi-Fi. Minibar, radio and heating are among the amenities offered in Candelas de Ushuaia. Each apartment is fitted with a kitchenette and a seating area. Daily cleaning is provided. Additional hotel´s features are a 24-hour front desk, barbecue facilities and tour desk for booking excursions in the area. Laundry services can be also provided. Located in the capital of Tierra del Fuego province, Candelas de Ushuaia is conveniently a 5-minute drive away from the airport. Located in Ushuaia, Hosteria Slogget offers panoramic views of Beagle Canal and Cordillera de los Andes. Facilities include comfortable rooms with free Wi-Fi, an airport shuttle service, and complimentary parking. Rooms at Hosteria Slogget have bright, white interiors with touches of dark wood. All rooms have cable TV, a well-stocked minibar and scenic city views. Guests at the Slogget can enjoy its proximity to the Cerro Castor Ski Station. They can also take a walk to the main beach, located 4 blocks from the hotel, or enjoy hiking in the Tierra del Fuego National Park. A continental breakfast buffet with homemade tarts, cake and croissants is served daily, overlooking the scenic mountain region. The center of Ushuaia offers plenty of choice in terms of local cuisine. Hosteria Slogget is conveniently located only 10 minutes by car from Ushiaia Airport. Cumbres Del Martial is a cosy mountain lodge hidden in the Bosque Fueguino Forest, 7 km from Ushuaia. It offers spectacular views of Beagle Channel. Rooms at Del Martial feature traditional stonework interiors and antique country furniture. All have an LCD TV, free Wi-Fi and a balcony with views of Esperanza Stream. Some have a fireplace and hydromassage tub. Guests can enjoy fresh cheese cake in the tea house, while the restaurant serves Patagonian lamb and fine South American wines. A breakfast buffet with fresh croissants and glazed cakes is served daily. Cumbres Del Martial is 5 km from Malvinas Argentinas airport. It offers free parking and a car rental service. Guests can contact the hotel to arrange an airport shuttle service. 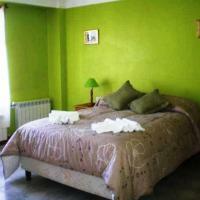 Hosteria Les Eclaireurs is located 1 km from San Martin Main Street. It offers free Wi-Fi and free public parking. Rooms have minimal furniture with tasteful wooden floors. All are equipped with private bathrooms with hydromassage tubs. Hosteria Les Eclaireurs offers a homemade buffet breakfast. Many dining options are available in the area. Guests can enjoy reading a book and relax on the rooftop terrace with panoramic views. Featuring chalets with scenic views of the Beagle Channel and the Andes Mountains, this small hotel is near Tierra del Fuego National Park. It offers a tour desk, free Wi-Fi and complimentary parking. Bungalows at Cabañas del Hain provide heating, a sitting area and a fully-equipped kitchenette. Also included are ingredients for a substantial breakfast, such as assorted beverages, bread, cookies and jam. Guests can use the game room and the library for leisure. Laundry services are available and there is a 24-hour front desk. Cabañas del Hain offers a tour desk, car rental and shuttle service. It is one mile from Ushuaia Airport and 2 miles from the center of the city. For going downtown, visitors can catch the bus at the stop located 650 ft from the hotel. The ride takes 15 minutes. Posada Del Fin Del Mundo is a cozy mountain lodge in Ushuaia, set against a stunning Patagonian Mountain backdrop. It offers skiing, fishing and pleasant rooms with free Wi-Fi. Rooms at Posada Del Fin Del Mundo have polished hardwood floors and are equipped with cable TV. All have soft lighting, panoramic forest views and private bathrooms. A breakfast with granola, chocolate croissants and eggs is served daily. Guests can also make use of the room service option, or dine at any one of Usuaia´s local restaurants and bars. Guests can contact the hotel to arrange an airport shuttle service. This small family-run hotel features panoramic views of the Ushuaia Bay and tango music lessons. It is a 15-minute walk from downtown, offering a tour desk and free parking. The accommodations at Tango B&B are homey. They include a private bathroom, plus heating, safe and free Wi-Fi. In a dining room with ample windows and scenic views of the bay and nearby forest, guests enjoy a continental breakfast featuring a variety of teas and fresh breads. Guests at Tango B&B can also arrange various transportation, laundry and bar services for an additional fee. For stays of longer than 3 nights, visitors can enjoy a free tango music show. Tango B&B is on Montes Martiales Hills, a 5-minute walk from the pier. Malvinas Argentinas International Airport is a 10-minute drive away. Located in the world’s southernmost city, Ahnen offers fully equipped apartments 2 blocks from downtown Ushuahia. There is free Wi-Fi access and unlimited local calls. Ahnen is a family-run apartment complex decorated in a homey style. It features apartments with full kitchen and kitchenware, refrigerator and microwave. There is a BBQ area to prepare Argentine-style grilled meat. All rooms come with heating and practical amenities such as cable TV and private baths. They have decorative rugs and wood furnishings. Guests are welcome to inquire about trips around Emerald Lagoon, trout fishing excursions, and the famous train to the end of the world. The apartments are located just 2 miles from Malvinas Argentinas International Airport and a shuttle service is available for an extra charge. Overlooking Ushuaia bay, The House offers rooms with cable TV and free Wi-Fi in an alpine-style inn with a fireplace. Ski resort shuttles can be arranged. Rooms in the The House have heating and parquet floors. They all come with fully equipped private bathrooms and wood finishings. Room and laundry services are available. A breakfast buffet is served in the lodge's living room, decorated in wood and stone. Guests can enjoy fresh juice, coffee and regional jams with a view of the ocean. Those willing to relax with a book in front of the fireplace have access to a library. Guests can also visit the museums and stores on San Martin Avenue, only 2 blocks from the lodge. Ushuaia Airport is a 10-minute drive away. Guests are welcome to inquire about shuttle services to the airport at the 24-hour front desk. Just a 10-minute drive from Martial Glacier, Del Martial offers stylish accommodation with views of the lake and access to privileged bird-watching spots in the Andean forest. Wi-Fi is free. With plenty of rugs, warm hued fabrics and wood furniture, Cabañas Del Martial are equipped with satellite TV. They have a full kitchen with microwave and refrigerator, coffee and tea makers. A dining area is included. The room features a sofa, white linen and towels and private bathrooms. Some rooms have a balcony with an open view of the garden and mountains. A continental breakfast is served daily with coffee and regional products. Guests can choose to enjoy it in the privacy of their rooms. The cabins are an 8-minute drive from downtown Ushuaia and a 10-minute drive from Ushuaia’s international airport. Car rental services can be arranged and there is free private parking on site. Combining a modern glass panelled ceiling breakfast area with classic alpine-style décor, the hotel offers rooms with panoramic views of Ushuaia Bay and the Beagle Channel. There is free Wi-Fi. Rooms at Hosteria Patagonia Jarke are equipped with heating, baths and cable TV. Wood furnishings, parquet floors, deep red bedspreads and matching rugs create a warm ambiance. Laundry services are available. A continental breakfast with coffee, bread toast and regional jams can be enjoyed daily at the bar. The hotel treats guests to free mineral water, chocolates and hot drinks throughout the day. Jarke is a completely non-smoking hotel and facilities include a children’s playground. Downtown Ushuaia is just a 5-minute walk and car rental services are also available. Ushuaia Airport is 6km away. Just 5 blocks from scenic Encerrada Bay, Ahnen I has fully equipped apartments with cable TV, free Wi-Fi and private parking in Ushuaia. Shuttles may be arranged. San martin's main street is 100 metres away. Departamentos Ahnen I offers spacious two-bedroom apartments with simple homely-style décor. They feature heating, light blue bedspreads and linen. Private bathrooms are modern and feature hairdryers and bathtubs. Ahnen features fully furnished kitchens with kitchenware, microwaves, ovens and refrigerators. Guests are welcome to inquire about excursions to Tierra del Fuego National Park and Lapataia Bay at the 24-hour front desk. Ushuaia Airport is 10 minutes by car from Ahnen I. 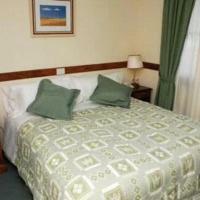 Just 2 blocks from Ushuaia Bay, Austral has nicely decorated rooms with free Wi-Fi and parking. Excursions to Lapataia Bay and airport shuttles may be arranged. Rooms at Hotel Austral Ushuaia are styled in a warm palette of browns and oranges. They have cream or light green-colored walls and carpeted floors with cable TV. Some bathrooms feature baths. A buffet breakfast with regional jams and hot chocolate can be enjoyed at the bar which features views of the city and surrounding grounds. The living room is furnished with sofas, a computer and a TV. Austral offers ski storage facilities and a handy check-in/check-out service. Offering splendid Beagle Channel views from every room, impeccable décor and gourmet flavours, Los Acebos is only a 15-minute drive from Ushuaia Harbour. Wi-Fi and private parking are free. Rooms at Los Acebos Ushuaia Hotel are carefully styled to the last detail in full 5-star fashion. They feature elegant cloth panelling, matching throw blankets in a palette of olives and deep reds, and floor-to-ceiling curtains. All rooms feature cable TV, minibars and carpeted floors. Some bathrooms include baths with stylish wall-paper patterns and wall mouldings. There are laundry services. A buffet breakfast is served daily with Patagonian jams and treats. At dinnertime, guests can enjoy gourmet flavours at Réve D´Orange restaurant with panoramic views of the mountains and lake. Scenic Fagnano Lake is a 50-minute drive. The front desk offers 24-hour assistance. Boasting a spa, an indoor swimming pool and a whirpool, Las Hayas Resort Hotel offers rooms with Wi-Fi and a sea view. There is a restaurant and a terrace. Ushuaia harbour is 3 km away. All the rooms at Las hayas Resort have large windows with a sea and a mountain view. Some of them feature spa baths and plasma TVs. A buffet breakfast is daily served. Le Martial restaurant serves international dishes à la carte. Spa facilities include a sauna, a hammam and Turkish baths. A fitness centre, a squash court and a children’s indoor pool are also available. Guests can request a massage session or enjoy themselves reading a book from the library. The End of the World Train is 10 km away. Las Hayas Resort Hotel is 55 km from Fagnano Lake and 26 km from Castor Hill. Set in a picturesque Alpine style building in central Usuahia, 50 metres from the Casino, Hotel Villa Brescia offers rooms with free Wi-Fi and cable TV. Breakfast is provided. Usuahia’s Harbour is 600 metres away. Fully carpeted, rooms at Villa Brescia Hotel feature work desks and private bathrooms with hairdryers. All of them have heating and minibars. An American breakfast including scramble eggs and bacon is served daily. There is also a coffee store. Excursions can be booked at the tour desk. Hotel Villa Brescia is 26 km from Castor Hill and 22 km from Usuahia’s National Park. Malvinas Argentinas Airport is 5.3 km away. Surrounded by Patagonian forest, the hotel boasts splendid views of the Beagle Chanel. Rooms have tasteful décor and free Wi-Fi. Lapataia National Park is 8 km away. Altos Ushuaia features a large living room area with parquet floors, exposed stones and large windows with scenic views. Rooms are equipped with flat-screen cable TV and private bathrooms with showers. The suites have spa baths and some of them also have private balconies. Castor Hill is 30 km from the hotel. The tour desk can provide information and tips on visiting the area. Guests can wake up to fresh juices, croissants and regional jams in the breakfast area, styled with cosy wood furnishings and boasting impressive views of the scenery. There is 24-hour front desk assistance and Ushuaia Airport is 3.5 km away. For guests who are driving, on-site parking is available. Rooms with garden views can be enjoyed in this Alpine style inn tucked away in the Patagonian forest. Wi-Fi is free. Familia Piatti B&B has cosy family-run accommodation only a 5-minute drive from Ushuaia’s main street and entertainment area. Rooms are tastefully styled in a warm palette and feature wooden furnishings, carpeted floors and tapestries. All rooms have private bathrooms with showers. A full continental breakfast with regional jams and croissants can be enjoyed daily. Ushuaia’s harbour is a 10-minute drive. Car rental can be arranged and there is free public parking nearby. There is 24-hour front desk assistance and Ushuaia’s International Airport is a 15-minute drive. This charming Patagonian inn is styled with rustic wood finishings and offers free Wi-Fi. It is located across from Laguna del Diablo Lagoon. Ski and ice-skates rental is available. Rooms at Hostal de la Laguna are equipped with heating and private bathrooms with showers. Some of them have garden views. A full continental breakfast with regional jams and breads is served daily. Guests can treat themselves to local flavours at the restaurant. Ushuaia’s National Park is 18 km from the inn. The tour desk can offer handy tips for visiting the area and arrange car rental. There is 24-hour front desk assistance and the city’s airport is 3 km away. Practical rooms and apartments are available just 5 km from Ushuaia’s airport. La Posta has cosy accommodation with free Wi-Fi. Ushuaia’s National Park is 10 km away. Private parking is free. La Posta Hostel Apart has rooms with shared bathrooms and fully furnished apartments with kitchen facilities. There are 2 common kitchens and a dining area styled with rustic wood fittings. La Martiel Glacier is 15 km from the hotel. Guests can rely on the tour desk for the best tips on visiting the area. The front desk offers 24-hour assistance. Tastefully decorated rooms with free Wi-Fi can be enjoyed just a 5-minute walk from San Martin Avenue’s shops and cafes. Guests can help themselves to cookies and milk all day long in the kitchen. Mysten Kepen B&B offers a cosy living room with a fireplace and is only a 5-minute walk from the Museum of the Sea. At Mysten Kepen, rooms are styled in warm shades and feature cable TV and private bathrooms with baths and toiletries. A continental breakfast with hot chocolate and cereals is offered daily. There is a common kitchen with wooden cabinetry for guests to prepare their own meals. Packed lunches are available for day trips. Guests can rely on the tour desk for advice on visiting the area and arrange car rental. Shuttles to Ushuaia International Airport, 7 km away, can also be arranged. Situated in the Land of Fire – Ushuaia, Posada del Pinguino is 600 metres from End of the World Museum. Boasting scenic views, the property offers a daily breakfast and rooms with free Wi-Fi access. Just 200 metres from the Main Bus Stop, Posada is a 5-minute drive from the commercial port and the Maritime Museum. The Malvinas Argentinas International Airport is a 10-minute drive away. Offering heating facilities and a hairdryer, rooms feature cable TV and a personal safe. Towels and toiletries are included. Guests can head to the 24-hour front desk for assistance with luggage storage, laundry or airport shuttle services. Travel arrangements can be made at the tour desk. Just 200 metres from San Martin Avenue in Ushuaia, Bahia Serena features heated apartments with a fully-equipped kitchen. It offers dry cleaning and laundry services. With a cable TV, refrigerator and private bathroom, the apartments feature a kitchen with a stove, sink and utensils. Some include a mezzanine floor. Housekeeping services are provided. Bahia Serena Apart Hotel is 7 km from Ushuaia International Airport, and 800 metres from Presidio Museum. Parking is free. Set in a charming Alpine-style house 2 km from Islas Malvinas Square, Arwen Mesheken Apart Hotel offers self-catering apartments with free Wi-Fi in Ushuaia. Breakfast is provided. Encerrada Bay is 2 km away. Decorated with parquet floors and wooden rustic furnishing, apartments at Arwen Mesheken have large windows offering garden views. All of them feature cable TV and spacious seating areas. Self-catering facilities include kitchen equipped with microwaves, and separate dining areas. A continental breakfast is served daily. Excursions can be booked at the tour desk. The End of the World Museum is 3 km away, whereas the National Park is 15 km away. Free parking is provided. 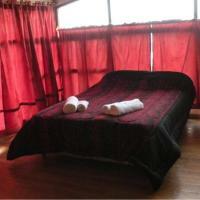 Arwen Mesheken Apart Hotel is 30 km from Castor Hill and 5 km from El Martial Glacier. Featuring free Wi-Fi, a PC for guest use, and a common living room with satellite TV, Tzion B&B offers Continental breakfast, and is located 8 blocks from Ushuaia’s Harbour. 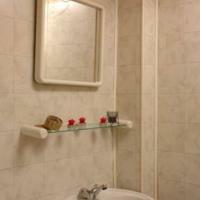 Some rooms in Tzion B&B feature a private bathroom and others feature shared bathroom facilities. All rooms have splendid views of the Beagle Channel and/or the surrounding mountains. Room service is provided daily. Runned by its owners, customers can rely on accurate tourist information in English or in Spanish, and a real approach to the local lifestyle. Extra services include laundry, free luggage storing, and parking. Ushuaia’s Bus Station is a 15-minute walk away, and San Martin Street (the main street), The Old Jail, and the Maritime Museum are only a 10-minute walk away. Ushuaia’s Airport is a 15-minute drive away. Centrally located in the city of Ushuaia, this hotel offers free Wi-Fi and a buffet breakfast is included. The rooms in Hotel De Los Andes feature a desk and a safety deposit box. The 24-hour front desk can arrange laundry, dry cleaning and ironing services, and the tour desk can provide tourism information. Luggage storage is possible. Hotel De Los Andes is 400 metres from Ushuaia Bay and 800 metres from the Maritime Museum. Castor Hill is 26 km away and Malvinas Argentinas Airport is 5,6 km away.